Children need protection from identity theft even more than adults do. 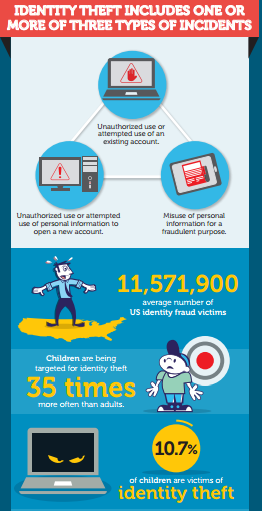 Did you know that 7% of all US households reported some type of identity fraud in 2013? What about that $21 billion in financial loss was attributed to identity theft in 2013? Or even that your children are being targeted for identity theft 35 times more often than you are? View this infographic for more identity theft statistics and 6 easy ways to protect your family from the disastrous consequences.